Who died in the battle against the army of the dead in Season 7 Episode 6? I was re-watching the seventh season of Game of Thrones and noticed that there are four(?) 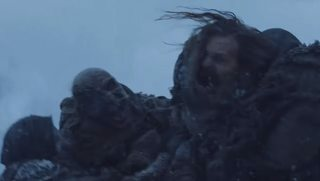 casualties in the battle against the army of the dead in episode 6, "Beyond the Wall". after he is attacked by the wight bear but I couldn't recognize any of the others. 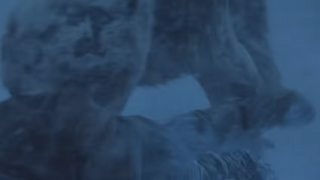 One was eaten by the wight bear, another fell into the water when the ice broke, and the other fell into a horde of wights while Jon was trying to rescue him. Who were these characters? Were they named? Also, can they be seen in the party that left the Wall in another moment other than their death? The first casualty is the lead scout who gets killed by the wight bear whilst running back to the main group. The bear then goes on to kill two further red shirts. The bear then fatally wounds Thoros. 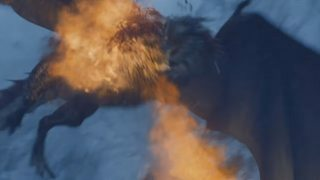 After that the bear is killed by Jorah with his dragonglass dagger and Thoros' wound is cauterised. When the group ambush the White Walker/wight patrol it's not shown anyone dying so we can assume no one does. 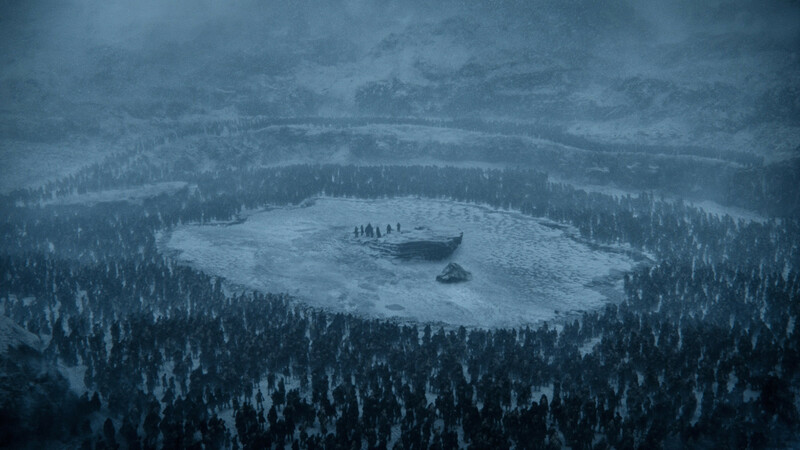 However, whilst they are running towards the island on the frozen lake one red shirt is killed by the wights. 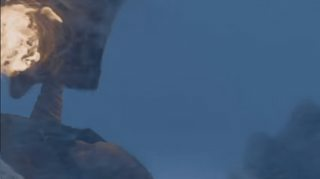 When this guy is taken out the frozen lake breaks up and stops the rest of the wights advancing. 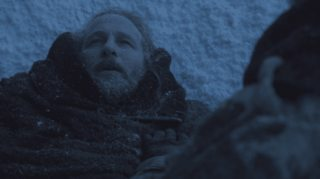 During the night that follows Thoros finally succumbs to his wounds and turns into a popsicle. The wights then attack the group of merry men on their little island and the group actually hold up relatively well. However, one red shirt get's rushed whilst using a spear and can't fight them off and ends up dying. Moments later the same fate comes by another red shirt. 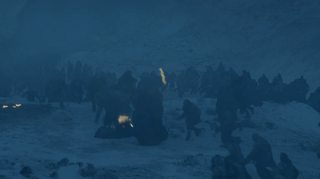 We then get a close scare with Tormund who is overcome by wights and even starts getting pulled into the water by some as the group starts to fallback. However, he is saved from becoming popsicle number 2 by Sandor. After that a red shirt helping Jon pull the captured wight further up the rock is rugby tackled off it into a group of waiting wights and mauled. After this Dany arrives to rescue the remaining merry men with her dragons. The next casualty is then Viserion as he's flying when the world number one javelinist, the Night King, spears it under the wing. At this point the main group escape and no one else is killed. 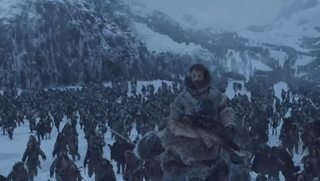 Later on when the main group of wights has left the area Benjen Stark, Coldhands, appears and saves Jon. 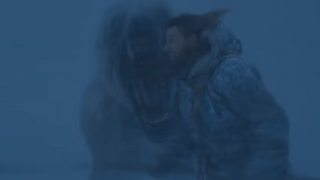 He puts Jon on his horse and stays to fend off the wights from chasing him. However, he is quickly overcome and is mauled, presumably, to re-death. I'm not sure they are all shown before they die as there appear to be inconsistencies with how many are shown in the group. Though these could be explained away by the group having used scouts like the one who is first to die against the wight bear. For example, when the wight bear attacks we are shown 12 men when there should be 13 though I assume the last could be a rear scout and isn't with the main group. That appears to be the best picture of the group all together. 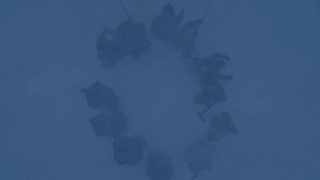 The following image shows there being around 8-10 people on the frozen lake. 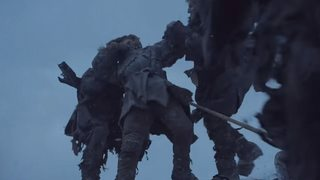 At this point 4 people have died with Thoros being fatally injured so there should be 10 people with 9 stood up and Thoros potentially stood or laying and the wight either on someone or on the floor. This could be me counting incorrectly or an inconsistency with how many people should be there but as it's not exactly that clear in the image it's hard to tell. Why couldn't the extra Rangers be revived? 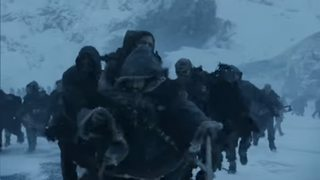 Who charged down the pile of dead soldiers/horses in the Battle of Bastards? What did Arya mean by “That's not you” in season 7 episode 2? Why did the army of the dead wait? Can the army of the dead embark on ships? 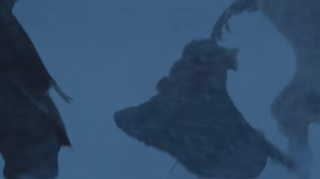 How did the dead recover Viserion?